Our School is a healthy school and all meals are prepared fresh on site by Mr Frankland our Chef and his team from Absolutely Catering. 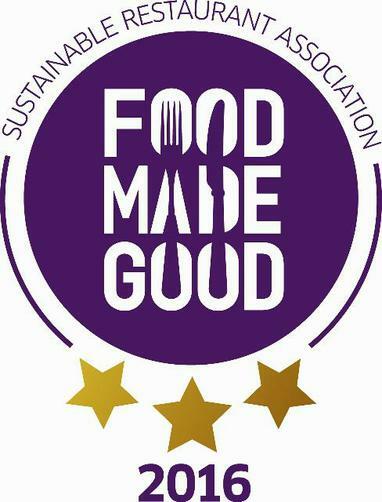 We are pleased to announce that Absolutely Catering have been awarded 3 stars in the recent Sustainable Restaurant Food Made Good Awards, they are the only schools’ caterer to achieve this award. If your child has any food allergies or intolerances these can be catered for, please make sure you let your child’s class teacher know. School dinners for Junior children cost £1.80 a day or £9 per week. Payment should be made to the school office or the class teacher on a Monday Morning. Infant children are entitled to a free hot dinner under the Government’s Universal Free School Meals programme. Child Tax Credit – as long as you have a yearly household income of less than £16,190 (as assessed by HM Revenue and Customs) and do not get Working Tax Credit.